Do you wonder what the top 5 horse training tips would be from an experienced horse person? Well, here they are. Read on to improve your training skills. Horse Training Tip No. 1. Pick the horse that is suited best for your needs. Her mane flies in the wind, her coat glistens almost gold in the sun over her sleek muscles. She is young and spirited, and you can see that as she playfully trots around the field. The seller has given you warning that she hasn't had much training yet, but all you see is the two of you cantering into the sunset. She turns to you with her oh-so-sweet doe brown eyes, both ears pricked and all attention on you. You read the question in her expression, "Will you take me home?" You are so totally in love with this filly. But she’s not for you. “Green on green makes black and blue” is a common quote in the equine world that means a new rider and a green (inexperienced) horse make for lots of bruises, headache and heartache. Mismatched horses and riders are one of the biggest reasons people that come in with a passion for riding get out of horses. Many times well intentioned parents will buy a young horse for their child so they can "grow up and learn together." Unless the young rider is a very confident and experienced already with basic horse training skills this is a bad combination. They canʼt get the horse to do what they want, or it is even downright dangerous. They will lose interest and move on. Donʼt be one of those people! Pick the right horse from the start! So, take it from an experienced horse trainer; one of my very top and simplest horse training tips is simply to pick the right horse. How can you pick the right horse? It is partially your gut instinct but more your plan and trying to remain as objective as possible through the process of seeking your next partner. Write down what you are going to use the horse for, what his current training level is vs. where you want to be, how much time you have available for training each week, and your competition level timeline and goals, if any. You should also enlist the help of a knowledgeable horse person or trainer which brings us to our next horse training tip. Horse Training Tip No. 2. Have a good trainer or have an extremely knowledgable horse person be your outside opinion. Yes, you can tell when your horse woke up on the wrong side of the corral, which lead he doesnʼt like to take, how he shies at the shadow cast just the wrong way and his favorite treats. That familiarity is what makes you a great partnership. It is also what can turn your relationship stale and even dangerous. People are great at making assumptions with their horse, while horses live in the moment every single day. So here is another of my top horse training tips: When things get tough, and they most certainly will at some time, it is very helpful to have that knowledgable and objective person you can count on to help set you and your horse straight again. It is SO easy to just train your horse based on your emotions. “He must hate me” is a common phrase from riders when things don't go the way they want them to. Horses just donʼt think that way. They think in terms of comfort and discomfort. You need to understand this when learning about horses. They can hang onto past things that have hurt them. If you are having problems you havenʼt been able to improve or get under control within a few training sessions you should ask for an outside opinion from a professional or trusted friend with loads of experience before things get worse. Horse Training Tip No. 3. The relationship with your horse should ALWAYS start on the ground. I donʼt know why a lot of people believe that if they just buy a horse, saddle it up and go ride that the horse should just blindly follow orders like some sort of robot. Itʼs a living, breathing animal. Itʼs not an ATV or motorcycle! If you want to ride something that never has an opinion then you need to get you a ATV for sure! Horses are herd animals and that means that in the wild they have a herd leader that calls all the shots like who eats and drinks ﬁrst. They have prey animal instincts to run from danger! That instinct is still in them even as they sit all pretty with their hair in braids in their barn. If your horse doesn't see you as a leader worthy of being followed, he is more than likely to use his own ideas and instincts. These may not be ideas that you agree with. In fact, so many problems with horses come from him not trusting or understanding us humans. They donʼt just think we are going hurt them with the clippers, they think they are going to die because their leg is wounded when they hear and feel the buzzing on their legs! In the wild, a horse cannot survive with a damaged leg because it can't run away! The instinct in the horse is strong to preserve themselves from perceived danger, which is a lot of the things we do to them. We have to prove to the horse we don't want him for dinner. When you have a language of communication established first through quality ground training, it will dramatically increase the bond you have with your horse while you are riding. He is going to be more likely to trust you and see you as his leader which will make your experience with him better all around. The majority of natural horse training programs have you start out on the ground for this reason. Another good source of information on groundwork can be found on horse training DVDs. Out of all the horse training tips, this one is more overlooked than you might think, especially for recreational riders who tend to just saddle up and ride! Horse Training Tip No. 4. You must have a plan! What are you trying to accomplish with your horse in training? What do you want to do together and how? Do you want him to be conﬁdent on the trail with a large group of riders, or do you want him to jump, run barrels, or do dressage? It is just like not having a destination but having a great roadmap or GPS. It means you can not be lost because you donʼt know where you are going. If you donʼt have a plan with your horse, then you will never arrive where you want to be! Just riding all the time with no purpose is bound to get you both bored, and your horse sour! Having a training plan that is broken down into manageable chunks and has a timeline based on your time and takes in to account the horsesʼ current training level and his learning ability will drastically cut down on frustration for the both of you! Horse Training Tip No. 5. Bad behavior does not mean you need harsher horse training equipment. You love to race barrels! The wind in your hair, the thrill of the pattern, your heart beats so fast it feels like it is going to pop out of your chest as you are running down the last stretch. You love it so much you do it over and over again to practice and every weekend at the rodeo. You can't figure out why your horse doesn't want to slow down at the end, or for that matter why he is so hot going in. So you get a bigger, harsher bit. You have to be able to stop him at the end of your run! Then he throws his head up high in the air with the new bit fighting you and adding on time to your next several runs. So you add a tie-down to physically keep him from putting his head up. That should do the trick, except it doesn't. This is a downward spiral and will teach your horse nothing other than not to trust you and that being ridden means pain! He may eventually slow down but it won't be because of respect for you or emotional control on his part. If his behavior is "bad" you need to look at the cause, not just the symptom. We train a horse by allowing him to repeat behaviors over and over again. If you take him to run barrels too many times in a row, he will start anticipating way before and won't be able to wind down until way after you would like him to! It doesn't mean he needs a bigger bit or a tie-down, it means he needs better training and more attention paid to his emotions. And those are the top 5 horse training tips! Horseback Riding Books -There are many books that offer horse training tips and techniques that can get your horses' training off on the right hoof! Check out this page to learn more. Professional Horseback Riding -Thinking of going pro riding horses? Read this article to see if you have what it takes and the steps to get you started. Clicker Training for Horses -This method of training offers a positive based approach and can solve many unwanted behaviors in horses. Horse Training Prices -Decided you don't want to or can't do the training yourself? This article explores what it may cost to have that horse professionally trained or the young horse started. Horse Training School -If you want to learn more in depth, maybe go for a formal education, you'll want to check out this page for more information on education options based around horses. 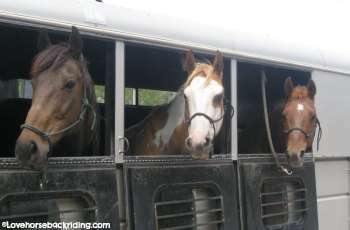 Horse Training Career -A Horse training career can be extremely fun and rewarding. Read this article if you are considering making a living training horses. Horse Training Voice Commands- Voice Commands are one of the most commonly used types of training. 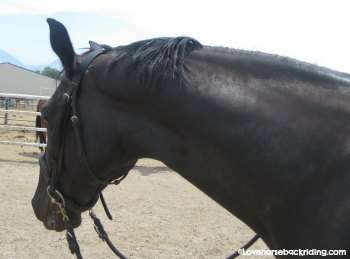 This article explains how to use them and the common pitfalls to avoid when you are teaching your horse voice commands. Gaited Horse Training- Want to learn more about training gaited horses? This guide will get you started.